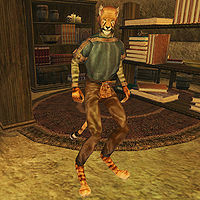 Jobasha is a Khajiit bookseller who is the proprietor of "Jobasha's Rare Books" in the western corridor on the upper level of the Lower Waistworks in Vivec's Foreign Quarter. His shop is stocked with many rare books and is guarded by an Ordinator, who was sent by Duke Vedam Dren himself, according to Jobasha. He is both directly and indirectly involved in many quests that require rare books. He is also an active abolitionist and works closely with Ilmeni Dren. In his store you can find "Charles the Plant," a unique potted plant that produces "Meteor Slime." He is wearing a common shirt with matching pants. Like all Khajiit, he can see well in the dark and can demoralize others for short periods. Aside from that, he knows: Divine Intervention, Mark, Recall, Detect Creature, and Detect Key. Vivec Informants: Speak with three informants in Vivec about the Nerevarine Cult and the Sixth House. Chronicles of Nchuleft: Search for the rare Dwemer book Chronicles of Nchuleft. Boethiah's Quest: Restore the glory of this forgotten Daedra Lord. Free the Slaves: Receive a reward for freeing some slaves. "What can Jobasha do for you?" Antecedents of Dwemer Law: "Jobasha knows this book well. Do you wish to buy? Perhaps Jobasha has a copy..."
Chronicles of Nchuleft: "Yes, Jobasha knows the Chronicles of Nchuleft. Perhaps Jobasha has a copy..."
Elsweyr: "It is the home of the Khajiit. Perhaps Jobasha will return someday." Fire and Faith: "Jobasha thinks Dorisa's shop in Balmora is the place to look." Morrowind: "How do you like it here?" my trade: "Jobasha reads books, buys books, sells books. What more can Jobasha say? Jobasha knows a little about everything. So you ask, and maybe Jobasha will talk." Twin Lamps: "You are a friend of abolitionists and a friend of Jobasha." Vampires of Vvardenfell: "It is a rare book. The Temple does not like this book, and could punish Jobasha if they knew..."
Vedam Dren: "Duke Dren sent guards to Jobasha's store. Are they here to protect Jobasha or protect others from Jobasha? Either way, Jobasha appreciates it." If the Entertainers official plugin is installed, Jobasha will have copies of the three new books added: I'm My Own Grandpa, The Balladeer's Fakebook and The Battle of Molag Beran. Jobasha's Rare Books is mentioned in Oblivion, where a receipt from the store can be found in Sundercliff Watch in Frathen Drothan's cabin. This page was last modified on 23 November 2018, at 06:22.